What kind of targets and attack vectors should I try? - RedWolf Security Inc.
What kind of targets and attack vectors should I try? What you should try first depends on your network environment and the kinds of assets you are protecting. We recommend going through an exercise to map your environment and identify your targets. • Determines the 50% and 70% performance/CPU thresholds of the critical services. • This is not an ‘attack’ but a ‘load test’. It identifies key performance thresholds that can be back-propagated to defense systems. • If you do not know what throughput your services can give, how can you protect them? • Tests local infrastructure, attack mitigation, load-balancers, and services under controlled attack conditions. • Targets that should be included include the previous targets as well as VPN’s, communications services (e.g. Mail (SMTP & Web Mail access), and conferencing (e.g. Skype for Business)). • Test first with 80% “Level 1 – Basic”, and 20% “Level 2 – Intermediate attack vectors”. Only after these are all ranked ‘Good’ or better should “Level 3 – Advanced” attack vectors be considered. • Most vectors ramp-up carefully and slowly to identify any vulnerabilities before defenses activate. • Every year: repeating previous year’s weakest tests, adding in new targets and increasing the attack sophistication. • Trusting a 3rd party with the fate of your organization shouldn’t be based on ‘blind-faith’, it should be ‘demonstrated capability’. • Ideally this should be run with a 4-6 hour test window PER 3rd party defense system. 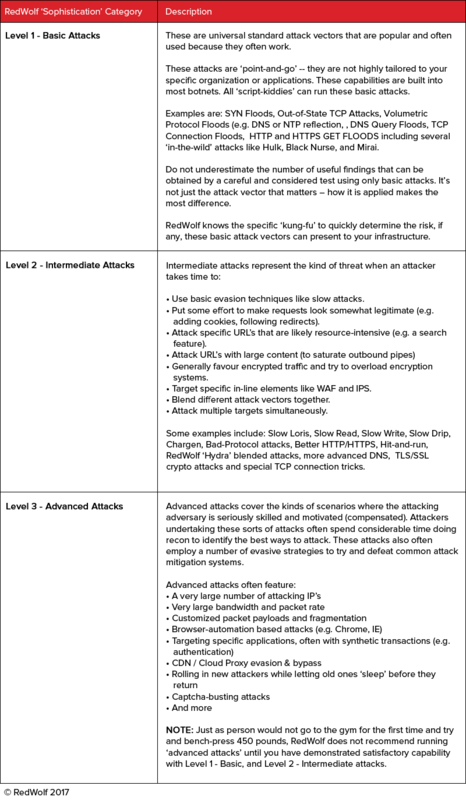 In a 4 hour test window up to 8 different attack scenarios can be tested. This will include volumetric, connection-oriented, various Layer 7 attacks. • Followed by a re-tests to ensure that any deficiencies have been addressed and that test coverage has been given to all critical targets. • Once for every new service protected by the 3rd party.